The rose of Sharon is a hardy plant that reproduces itself year after year with new shoots coming up from the ground right next to the established plant. If left unchecked, the plant can quickly get out of control in your garden or yard. If you don’t want to prune the plant regularly, the rose of Sharon must be removed or transplanted somewhere else. To dig out and remove the rose of Sharon and its roots, you’ll want to start early in the morning and be prepared to work for a few hours. 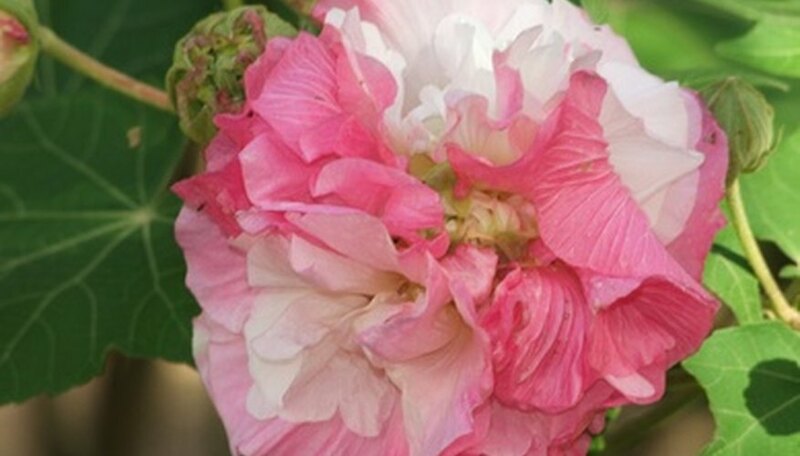 Dig up the rose of Sharon if you want to transplant it to a new location so the plant is fully dormant. If you plan on disposing of the plant entirely, dig it up at any time of year. Cut off all of the limbs of the plant with a hand saw only if you are going to discard it, but leave as much of the plant intact as you can for transplanting. Dig a circle around your rose of Sharon with a shovel, starting a foot out from the base and geting as far down in the soil as possible up to 1 1/2 feet deep. Use a pickax if necessary to break up the soil, but try to avoid severing large roots so you can pull the entire plant up. Work inward toward the base of the plant to loosen and remove the soil around the root ball. Rock the rose of Sharon from the base occasionally to check for looseness and continue to work your way under the plant in the hole. Lift the rose of Sharon from the hole once it is fully loosened. You may need a friend to help you lift the plant if it is large, especially if you are transplanting it, so it doesn’t get damaged. Either set the intact plant off to the side for transplanting or discard the unwanted plant. Pull out any remaining roots and use the pickax when needed to free them. Discard the roots and fill in the hole with garden soil or topsoil. Depending on the area you have pulled your rose of Sharon from, replant the area with plants better suited to your landscaping, or spread out grass seed and let the hole grow over. Be on the lookout for new rose of Sharon shoots the following spring in case any seeds fell in the fall. Dig up the shoots immediately to prevent new plants from growing.